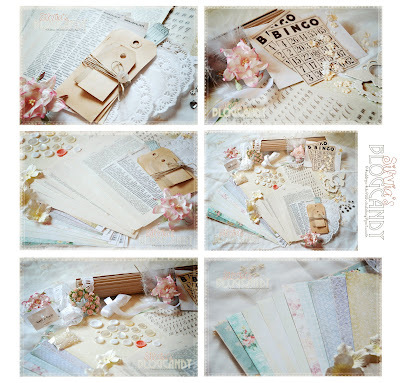 Shabby Chic Silvia: Silvia's BlogCandy Giveaway!!! 2) To double your chances- grab the picture above and link my candy on your blog by either post or sidebar and leave a comment letting me know. Winner will be announced Monday, October 5th!!! Good luck, and help me to invite others to play along! What a yummy candy - and soo much of it tooo!!! I have popped you in my sidebar!! Oh fingers and toes and everything else crossed!! Thanks for the chance of winning! What wonderful stuff and it would go so nice with my other vintage stuff that I own. I am posting this on my blog now. What a wonderful giveaway. International shipping as well. That is so sweet. Count me in. What a shabby lovely candy! LOVE IT!!! I'll have your candy on my sidebar. WOW!!! Silvia!!!! You have fantastic blog, great works and now - Your candy!!! It's amazing! I have to link it on my side bar! Great candy--- thanks for the chance to win! I linked you in my sidebar! Thanks for the chance and welcome to my blog! I put your candy on my sidebar. Hoooope to win this cutey! Den bloggcandyen såg søt ut, skulle gjerne hatt den! Du har ein super blogg, er kjekt å vere innom å sjå alt det fine du lagar! That's very beautiful, thank u for a chance!!! Silvia!!!! You have fantastic blog, great works and now - Your candy!!! That's very beautiful, thank you for a chance!!! What a yummy candy silvia!! Beautiful blog of very talenteg scraplady! You are in my sidebar for a couple of month's allready!!! And you blogcandy is fantastic. love it love it love it. oh wonderful Silvia, so happy to see you celebrating your blog! I have always adored your blog and work, super talented, I have post picture and link to your blog on my blog side bar hun! Great candy! Thanks for the chance to win! I'll have your candy on my sidebar. great blog candy in a wonderful blog! wow...i dream about your candy!!! !it's very beautiful candy and your works very fantastic! i am your follower! Hi! Your work is absolutaley amazing I especially love your cards. You always have great ideas. What a lovely candy! I love you work! so tender candy! I like it so much!!! Så flott candy! Jeg vil gjerne være med og har lagt en link til candyen på bloggen min. Thank you for sharing to us your wonderful website. I can’t think about life without these sweets. Har lagt den til i sidebaren min! Fabulous candy!!!! !...I will post it on candy corner now. thanks for the chance. What a beautifull blog and what a lovely blog candy! Yummy. I put the picture on my blog! Can't wait till de 5th of oktober.......this would be a wonderfull present for me because that day is my birthday!!!! Beautiful blog candy Silvia. Thankyou for the opportunity to win. to be honest, how can ik leave a candy like this not to be taken??? love your blog too, thanks to ann-marie i came here! will be following from now! and a link is also on my page! I love your blog. Congratulations on your 1000th post. That's so sweet of you! Love your work! I'd like a chance to win. Looks like some yummy candy. Thanks. yummy yummy candies...thanks so much for letting me play along.. This is such a fun and beautiful blog candy. Thanks for the opportunity. Such a yummy candy! Thank you! It's on the sidebar of my blog. Wow - very generous and the opportunity for an international scrapper to win as well. Blog candy will hopefully appear on my blog - but unfortunately some of us are more techno challenged than others. All beautiful stuff wich is hard to get in the Netherlands. Especialy papers from Melissa Frances ! Anyway, your work is fabulous too ! I found your blog through Ann Marie's and I am trilled by it, such beautiful work you have made. Thanks for the opportunity to win you blog candy, I will announce it on my own blog as well. 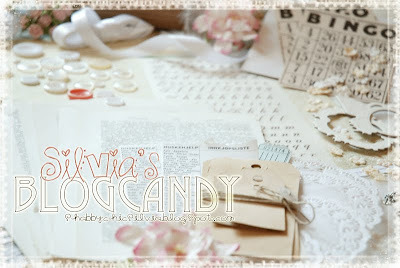 lovely lovely blog candy, truly wonderful! candy very beautiful, thank you for a chance!!! Greetings from Ukrainy.Oy any candy))) I should be the sword of victory)))) Thank you for the opportunity to win such a miracle! Du har en nydelig blogg og lager utrolig mye fint. Er innom hver dag for å få inspirasjon. Er i begynnerfasen av scrapping og skuller gjerne hatt en som deg i nærheten. Love your blog and to watch all the beautiful things you make - and I want to join the candy! Will add a link on my blog. Nice blog candy you're offering. Thanks for hosting. what a lovely blog candy! i love vintage stuff. What an amazing candy! I love your blog. I am a follower for a while now. All the things you make are so beautiful!! Thank you for the chance to win! i love it ! and thanx for your inspiration every time! Your work is amazing and inspiring!!! I just love your website. You are a creative goddess. Unfortunately I do not have a blog. But I will still keep my fingers crossed. Yummy! Posted a link on my blog! Your Blog is great. I'm glad I discovered it. And your giveaway is amazing. Wow what a lovely candy... but your blog is even better. Nydelig give-away!! Den vil jeg veldig gjerne vinne altså =) Så jeg har linket i sidebaren med bilde og det hele :) Du har en nydelig blogg, du lager så utrolig mye flott!! Your works are fine! And very much it would be desirable to win this sweet! You have a great blog, love the gorgeous things you create!! Nice blog candy, thanks for the chance to win..
Oh and I did put you on my sidebar..
You have a fantastic giveaway. pretty pretty stuff. thanks for your generosity. wooooow amazing candy how i would love to win this and give it all a great home i would sit and admire it for a long time. i am a follower and i have added a link in my side bar. lovely lovely candy! Trying to post it onto my blog now! What a shabby lovely candy! LOVE IT!!!
. I am posting this on my blog now. Forgot to tell, I put the link on my blog on the sidebar. Very beautiful! Love your blog. what beautiful candy. looks like a delight. Sorry I don't have any blog but I let people know as much as I can. Your work is so creative and so beautiful it's a pleasure to discover it each time. Thanks for sharing. Og bildelink er lagt til i bloggen min! Seams I forget to leave a comment! You have wonderfull blog, great works. I had link it on my side bar! Hi Silvia! Really glad to find your blog and become a follower! Thank you for the inspiration! And also thank you for the chance to win such a lovely candy! Really love it! Thanks for the chance to win this yummy candy. I added the picture of your candy in the sidebar of my blog. WOW...I love your work...extremly unique. i left a message on my blog about your candy. You have a great blog - gorgeous !!! Nice candy, thanks for the chance to win. Picture is on my blog. Your works are very beautiful!!! For en super flott blogcandy. Magnifique candy blog, je tente ma chance ; bonne journée. O! this a very nice candy. Thanks for the give a chance to win. I'll have your candy on my sidebar. I don´t have a blog, but thanks for a chance to win anyway. I come her often for the inspirations - I absolutely love the stuff your are making.. always with that special romantic feeling..
your work is just gorgeous!!! Sivia, it's amazing candy! Wondeful thing you do!!! I'l try to win...Thanks! and soo much of it tooo!!! Fantastic blog!!! Fantastic candy!!! I'm your follower!!! Wow! For en fin blogg, og en fantastisk candy som ligger å venter på en heldig vinner! Wow get stuff love your work Hey the 5th is my birthday what a present that would be. Wish i had a blog!!! Great giveaway! Thank you for the chance to win! I put your candy on my sidebar. Jeg har lagt deg til i bloggen min. Wonderfull candy--- thanks for the chance to win! What an amazing blog, your work is so inspiring! Thanks for the opportunity to win the yummy candy! Ohhh, count me in. I struggle trying to make a vintage card. I bet an assortment of goodies picked by you would do the trick! Lovely assortment. You are so generous!! Nå har jeg linket til denne candyen i venstre sidefelt i min blogg. Hello, Silvi! Your candy so cute, so sweeet, I like it! Thanks for chance win it! I love your works! I GO TO POST YOUR LOG. I have popped you in my sidebar!! What a shabby lovely candy! lOOK IN MY BLOG THERE SIS MY CANDY FOR MY ANNIVERSARY. YOU ARE WELCOME. Hi there Silvia, Thanks for the great chance to win. I'm off to post on my blog. Love your blog! Thanks for the opportunity! I´m have a Candy to, come to visit me! The candy in Russia can get? Thanks for chance to win! Silva, you have fantastic works. And amazing candy!!! Så mye nydelig du har i denne Candyen! Flott blogg - masse inspirasjon å hente! Jeg har lagt til bilde og linket til bloggen din. Thank you for a chance to win this Great Candy! I have posted your Candy in my sidebar! I really like you're candy a lot. I put you're candy into my blog. You are so kind! I've linked you up on my sidebar and then I'm coming back to take a closer look at your creations! Thank you. Hope it's ok, I put up some pics from your blog too... the beautiful bird is my favourite. Here's my blog post. Thanks for the opportunity, my fingers are crossed! Så flott Blog Candy du har!!! WOw vad mycket fint det var här! Jag är hemskt gärna med i blog candyn och har även länkat på min blog.Nu måste jag kika vidare här på sidorna! I have also put this on my sidebar in my blog! Love your candy!! You make very beutiful things and i always get inspired!!! I don´t have a blogg right now because i lost everything i own i a fire so i don´t have access to a computor as much as i need to! Så flott blogg du har :) Og for en blogcandy! Har nå postet blogcandy'en på bloggen min. What a lovely blog you have, i like your work very much. I will come back to see youe creations.